Kerbside collections of Waste and Recycling remain unchanged during Christmas and New Year period. Please put your bins out by 5am on the scheduled day or better still the night before. Bins could be picked up anytime from 5am onwards. If your bin is not out by 5am, there is no guarantee it will be collected. Please note that these items CANNOT be recycled - Please DO NOT place these items in your blue bin. Collection: Fortnightly on same day as general rubbish collection. Placed on the street verge approximately half a metre (0.5m) from the kerb with the lid opening closest to the road. 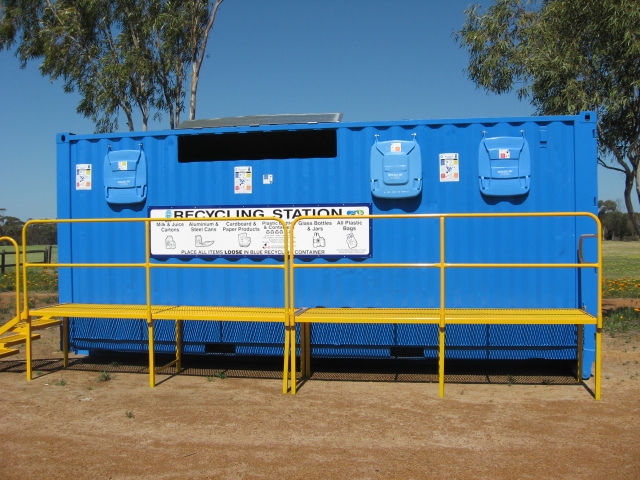 Green and blue bins need to be placed one metre (1m) apart to ensure the truck has room to collect each bin. Click Here for diagram. The loss of or damage to a bin caused by an occupant is the owner’s responsibility. The Shire of Esperance provides a weekly recycling collection service for businesses, schools and organisations that wish to participate. NOTE: A fortnightly collection is available for businesses only where it coincides with the residential collection. 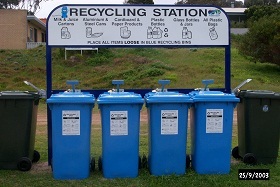 The recycling stations are available for use by all residents who live outside the current recycling collection area as well as tourists. Do not over load bins as it causes litter issues. Please report misuse to the shire on (08) 9071 0666.